If you follow me on Instagram, you might notice that I am a little bit obsessed with Instagram. It’s my favorite social network and I just love looking at photos from all around the world, sharing my own and even leaving comments (yes really)! I was thinking over the weekend about what makes me really love someone’s Instagram account and the main ingredient for me is that I want you to take me somewhere. I love travel and trying new things so many of the accounts I love are all about city photos and delicious food. Of course as a parent, I also like seeing what the kiddos are up to from time to time. Lots of love for these boys. I’ve basically just described the theming of my own account, but today I want to introduce you to 10 people who are doing it way better than I am. Maybe you’ve heard of them or maybe you’ll find someone new to follow. Either way, I think these folks are awesome and I can’t wait to tell you why! You can even enjoy pictures offline by getting a book of photos crowdsourced from Instagram like This Is Happening: Life Through the Lens of Instagram or Designers on Instagram: #fashion . @skimbaco – Katja is a world traveler and her photos embrace the beauty of everyday life no matter where she is. Her photos always leave a smile on my face. @OutaboutNC – A collection of photos submitted by people all over the state of North Carolina, OutaboutNC is the best of the best of our state and quickly becoming one of my favorite ways to get ideas for things to do in my own backyard. @skampy – Dana hits the Instagram jackpot with amazing food pics, an adorable baby and a cute dog. Who could ask for more? 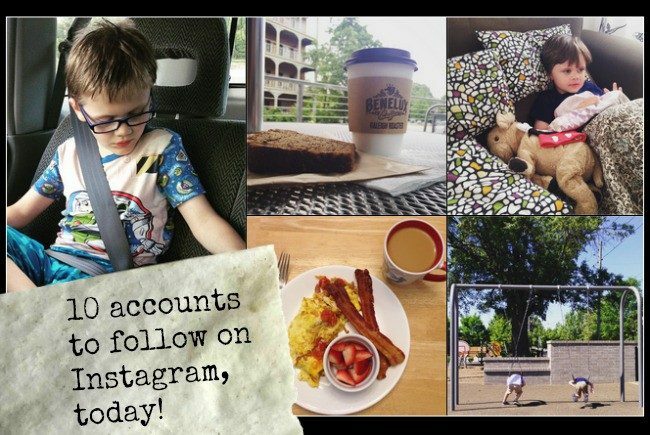 @herbadmother – I love the way Catherine captures her children in photos. It’s almost as if they are part of the landscape, which is always gorgeous. @momadvice – Amy is one of those people who shares the beauty in her life, but manages to always seem real. I can identify with her fashion sense and her projects are inspiring. She is currently traveling in Italy so I am loving the gorgeous scenery as well. @robalcaraz – As a fan of both LEGO and Star Wars , this account is possibly the best combination of both I’ve seen anywhere. I just love everything about each photo – including the captions. I just wish he posted more! @wdwshutterbug – There are untold numbers of official and unofficial Disney fan accounts on Instagram, but WDWShutterbug is top of my list. With two young boys darting this way and that, it’s hard for me to get a non-blurry photo at Walt Disney World , not to mention something like this! I mean come ON. @ferdalump – For your daily dose of talent + cute you don’t want to little miss Lane and her mother’s incredible Disney-themed costumes. I mean this woman can sew! @slingshotcoffee – Admittedly, I am friends with this awesome coffee-making duo, but I love their photos because they draw me to a place in my day where I can take a deep breath and remember what I am thankful for; good friends, good coffee and fresh air. @GirlGoneTravel – I’ve been following Carol Cain’s adventures for years and she has consistently been one of my favorite Instagrammers whether she is traveling or at home in NYC. I dare you not to get lost in her feed. As you can see, it’s easy to get lost among such amazing photos and hopefully this shows you a little bit about why I love Instagram so much! I’d love to hear some of your favorites in the comments below. Who should I follow next? Great picks! I’m following many, but added those I wasn’t following. These are some great account, and I thank you so much for using the #outaboutNC tag and giving it praise today. Many thanks. I feel honored. Oh what a fun thing, I love this! I follow a few of those already but always looking for new pix. Thanks! What a great list!!! I am now following a few new ones. what a great list of follows. It amazes me how many amazing instagram accounts there are, fully of eye-candy to get you dreaming.